Often the firearms industry tends to fall into a rut when it comes to innovation and design changes. Manufacturers are all too often apt to chase popular trends and dump money into the saturated AR-15 market due to sales volume rather than focus on being the next Uzi, MP5 or AK-47. The sad fact is, in a new millennium, we are still primarily using mid-century tech with very little change from original designs. Thankfully, companies such as KRISS USA aren’t afraid to do their own thing and step out of the industry comfort zone. 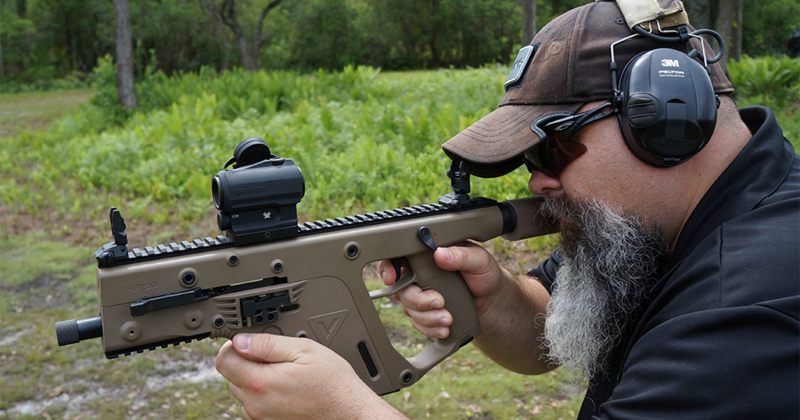 This week we take a look at the uniquely styled KRISS Vector pistol caliber subgun and its variants as a two year study ranging from desert of Las Vegas, Nevada to The Swamp training grounds in North Florida. Throughout history, the concept of carrying a pistol and carbine in the same caliber has made things streamlined and convenient for the end user. 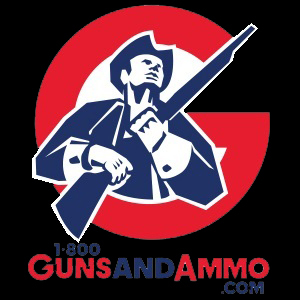 With the handgun, you have the advantage of having a firearm that is concealable and easier to carry, while the rifle offers better accuracy and longer range over the pistol. The most notable of these combinations was the Colt Single Action Army better known as the “Peacemaker” and the fabled “gun that won the west,” Winchester’s 1873 lever action rifle, both commonly chambered in either 45 Colt or 44-40 WCF. HK was able to capture the Military and Law Enforcement market in the mid-80s with the very same concept with their line of handguns and MP5 platform submachine guns chambered alike. For civilians, I believe the rifle / handgun combo in the same caliber still holds an importance in practical application today. In 2006, a new experimental design for a submachine gun came from KRISS USA (formerly Transformational Defense Industries). What would separate this design from those before it would be an unconventional, delayed blowback system to reduce recoil and muzzle climb. Using what KRISS labeled the Super V Recoil Mitigation System, it consisted of an articulated mechanism that allowed the bolt and an inertia block to move downward instead of rearward to more efficiently reduce felt recoil. These submachine guns achieved a rate of 1500 rounds per minute and proved to be a reliable option for the military and law enforcement market. In 2015, the first civilian legal, semi-auto model 9mm subguns from KRISS USA debuted at the industry only trade show known as SHOT SHOW as the KRISS Vector. Not only did these new models offer the Super V Recoil Mitigation System, but they also functioned using the most popular pistol magazines on the planet, the Glock 17 / 18 9mm high capacity mags. Labeled the Gen II, these models came in Carbine, Special Duty Pistol (SDP), Short Barrel Rifle (SBR) and Special Duty Pistol Stabilizing Brace (SDP-SB) lengths. Although basically the same firearm, the carbine with collapsible Magpul stock featured a longer 16” barrel with a rectangular barrel shroud resembling a suppressor instead of the 5.5” threaded barrel found on the others. The pistol version features the traditional subgun pistol length barrel minus the stock. The SBR features the same Magpul collapsible M4 style stock on the standard pistol length. The SDP is the standard pistol featuring a stabilizing armbrace. All these current configurations are offered in 9mm, .40 S&W, .357 SIG, 45 ACP and even 10mm. 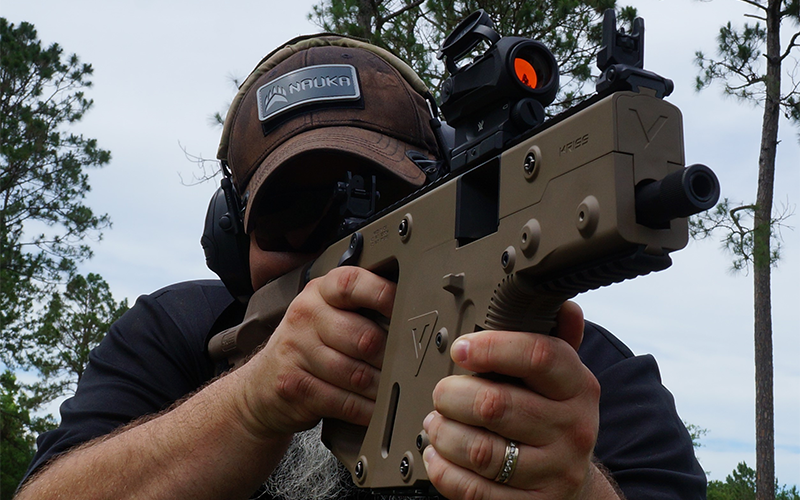 Recently, the Swanson Media Group team had the opportunity to spend a few months working with a sample of the KRISS Vector SPD-SB sent over by the folks at KRISS USA. With the addition of the arm brace, this set up is as close to the original short barrel pistol configuration as you get in semi-automatic without the need of additional tax stamps from the ATF. 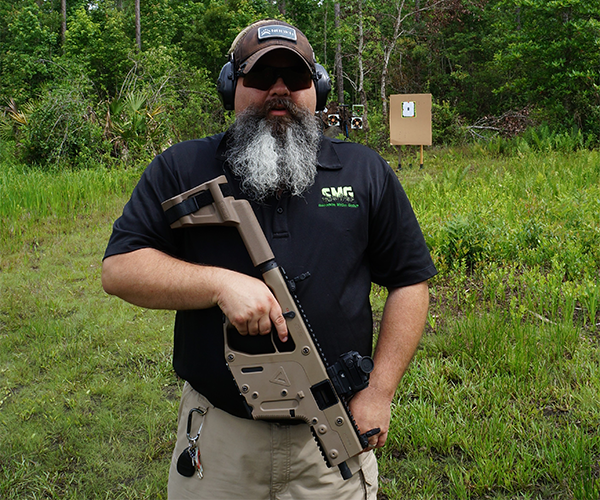 When I got the call to pick the KRISS Vector from our FFL partners at Legion Defense Industries, I met with the owner, Preston Mishikaiwa to do the paperwork for transfer prior to scheduling the initial range testing. Upon taking possession of the Vector, I opened the plastic hard case and did a quick inspection. To my delight, the pistol arrived in the Coyote factory option finish. My excitement came mainly due to standard factory black finishes get boring when it’s the 2oth firearm in traditional gun blue or Cerakote you have handled for review this year. 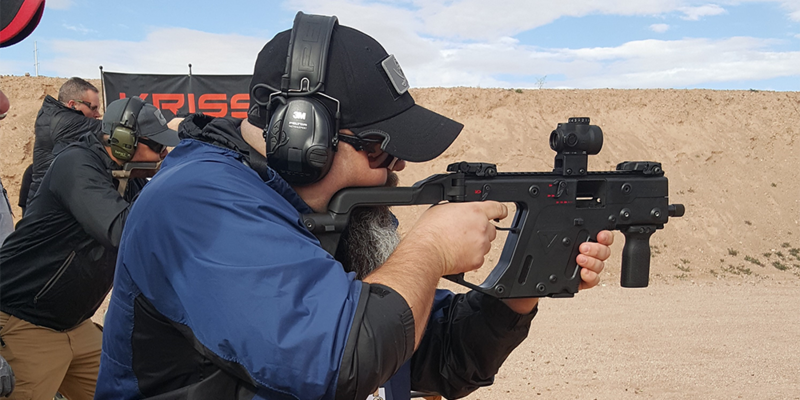 Having spent time with the full auto, class 3 submachine gun version of the KRISS Vector a few years prior during SHOT SHOW Industry Day at the Range, this would be my first time working with the semi-auto version. The first thing I noticed different from the older version I previously shot was the lack of the side folding stock. The first generation model featured the rear of the receiver with a hinged joint in which a fixed stock / armbrace or collapsible M4 stock was connected to. Now, regardless of stock option, there is no side-folding hinge. In my opinion, this greatly reduces the appeal of the compact design and makes it difficult to discreetly carry without drawing attention during the process of professional and civilian duties. Before to heading out to the range for the first round of field testing, I decided to mount a red dot optic on the KRISS Vector’s top Picatinny style rail that ran the full length of the receiver to co-witness the factory folding sights. I choose to use the Vortex Optics SPARC AR. For the past two years, I have been using this model optic with great results. Due to the quality of the Vortex optic, I was very comfortable in using it to test the Vector in which I had limited previous experience. Using the factory iron sights as a point of reference, I bore sighted the red dot in line with them. With the red dot mounted and ready for action, it was time to take the trek out to “The Swamp” training grounds to meet up with fellow Swanson Media Group writer, Clint Steele for a hot day of running rounds through the Vector. Once the target was set up and all safety procedures were checked, I spent roughly 15 rounds zeroing the red dot directly on center at 15 yards. Kudos to KRISS USA for shipping the Vector test sample with iron sights that were spot on accurate without any needed adjustments. Once these initial notes were made, Clint and I ran a series of rounds down range to continue our research noting items such as user friendliness of the controls, overall gun handling and accuracy at various distances. 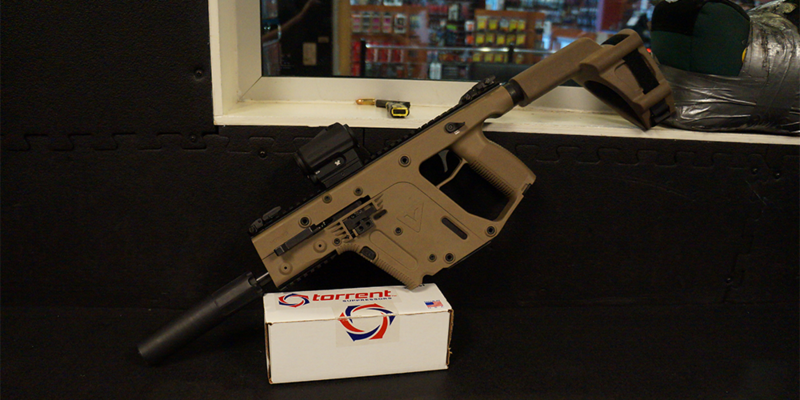 The KRISS Vector ships standard with a Glock 17 round magazine which ran flawlessly through the gun. In addition, I used two non-factory Glock style magazines with a 31 round capacity from ETS. We loaded up a verity of ammunition ranging from Fancy Brass Co 115 grain Full Metal Jacket ammo (FMJ), SIG Sauer 124 grain hollow point ammo, Winchester 115 grain FMJ and Federal 124 grain FMJ. Except for two shooter error stoppages, all three magazines and ammunition ran flawlessly over the 350 rounds sent down range between 5 – 20 yards on 6” steel targets. For the first test session, Clint and I both felt the arm brace made the Vector feel uncomfortable but not unusable. In its defense, the brace isn’t nor ever was, meant to be used from the shoulder, much less comfortable. Using the Vector’s arm brace as intended, gave me the same feeling as wearing snow shoes in grass. Its cumbersome, awkward and not viable for the original design of the KRISS Vector. For those with disabilities wishing to experience shooting the Vector, I would recommend the KAK blade style aftermarket brace instead. The trigger was, as expected, stiff but very manageable. To put that statement in context, keep in mind, the Vector was originally designed as a full auto submachine gun. By their nature, the triggers in firearms on this platform usually require long, heavy and deliberate pulls for safety and mechanical function. Given the circumstances, the Vector’s trigger was on the lighter end of the SMG trigger scale. I mention this factor primarily because users will face a learning curve when transitioning from an AR-15 platform with slicked up aftermarket triggers with pull weights of 3 – 4 lbs. While shooting, the non-reciprocating, left-side charging handle folded forward against the receiver when not in use. When needed, this charging handle was fast to access without looking with minimal practice. The serrated bolt-catch lever, located just below the charging handle, was easily operated with the thumb of my support hand as was the magazine release button. The immediate draw back I found during the first range session was accidently hitting the magazine release when switching to the left hand when shooting around barriers. More time training with the Vector could possibly prevent this from occurring or simply getting a Federal Tax Stamp for a Short Barrel Rifle (SBR) to add a real stock and foregrip as its originally designed for would immediately prevent this incident. The second range test session would be a completely different dynamic for testing overall. Instead of being outdoors, this session would be held on a plush indoor range at On Target Sports located in Orange Park, Florida. Prior to opening for the day, fellow Swanson Media Group writers, Clint Steele and Craig Reinolds along with myself, met with the range manager, Tyler Smith. Our team was allowed in early and given exclusive access to a private booth of multiple lanes to get started. RSO’s Todd and Wayland gave us full VIP treatment as the SMG team set up cameras and equipment to get our test session completed. Given the muzzle of the 5.50″ Vector’s barrel is threaded at 1/2-28″ Treads Per Inch (TPI), it can accept 9 mm AR-15 pattern muzzle accessories including suppressors. This test and evaluation session would include a model Ti9 suppressor from Torrent Suppressors. Once our test range was set up and ready to go, I took a few shots on target out at 10 yards unsuppressed to develop baseline data. At the given distance, the 1” offhand group was dead center and approximately 2” low. Same would be true with Clint’s first grouping as well. Even with the Vortex optic turned off, the flip up iron sights were quick to get on target and easy to see. I liked the “less is more” approach of the KRISS sights versus the polymer Magpul sights often seen on the earlier Vector models. The new sights fold flat and cleanly out of the way when using the red dot and co-witness perfectly when in conjunction with the SPARC AR. This is a feature I would like to see in more subguns. After removing the Vector’s muzzle thread protector and screwing on the Torrent model Ti9 suppressor, a series of shots were taken to note the first round flash, recoil, and reliability. With the booth being set in low light, any muzzle flash would appear easily. Using Remington 115 grain full metal jacket rounds, the super sonic ammo showed a signification reduction in sound as each shooter took their turn on the gun. Accuracy was spot on with the unsuppressed results with zero point of aim / point of impact shift. Follow up shots came much quicker and easier while running the suppressor on the Vector. Both the positives and negatives from both range sessions were varied and insightful. First round shots showed very little trace of muzzle flash as the follow up shots were unseen totally. Shooting suppressed changed the recoil from up and to the right to short impulses well below comfortable hearing levels. 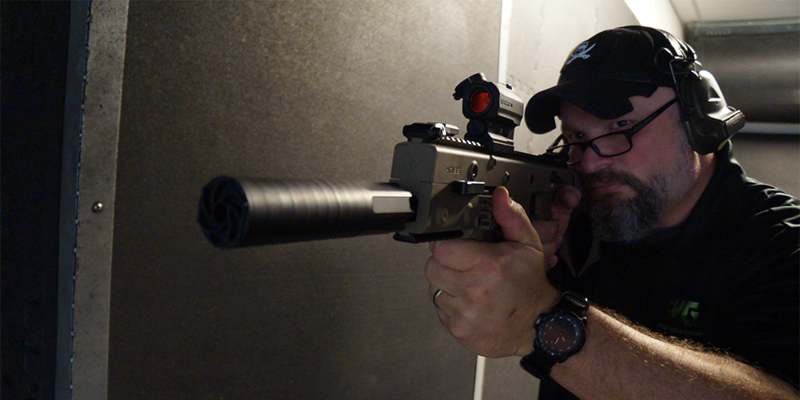 Craig noted that given the KRISS Vector’s short, stocky design, the Ti9 suppressor gave the gun a better sense of balance when shouldering the brace during shooting. Clint added the total package was compact and handled well for CQB work. I was very happy with the performance of the Vector unsuppressed and suppressed. Accuracy at realistic subgun distances was impressive and quick to dial in on target. 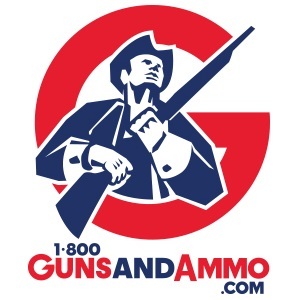 Through over 1200 rounds of assorted ammunition, factory Glock magazines and top aftermarket high capacity magazines, shooters experienced zero malfunctions. I liked the Picatinny style rail not only on top for mounting the red dot and iron sights, but underneath the barrel for mounting a foregrip if a tax stamp was acquired or if the Vector was in a rifle configuration. Left and right of the barrel were additional spots to add more Picatinny rails for weapon mounted lights or lasers if desired. With the overall short length of the firearm, a laser unit would prove helpful for indexing the gun quickly. The addition of a weapon mounted white light would have been great on the low light range as well. The negatives taken from testing were mainly in the controls. As a left handed shooter, Clint prefers to see the Vector to develop ambidextrous controls to facilitate keeping the gun running. As a right handed shooter, I often transition to weak hand stance to manipulate a firearm around barriers and to run injury drills. The inclusion of ambidextrous controls would benefit any operator, trainer or serious shooter. Craig and I agreed on the civilian configuration being a good distance apart from the intended design on how it is held when shooting. The original SBR, full auto design featured a short foregrip to stabilize hold and keep the support hand away from the controls. With the test sample we had in the civilian configuration, the support hand must grip unnaturally low on the magazine well. While shooting, the support hand tends to work itself up over the bolt release and once in a while gets pinched in the slight movement of the controls. 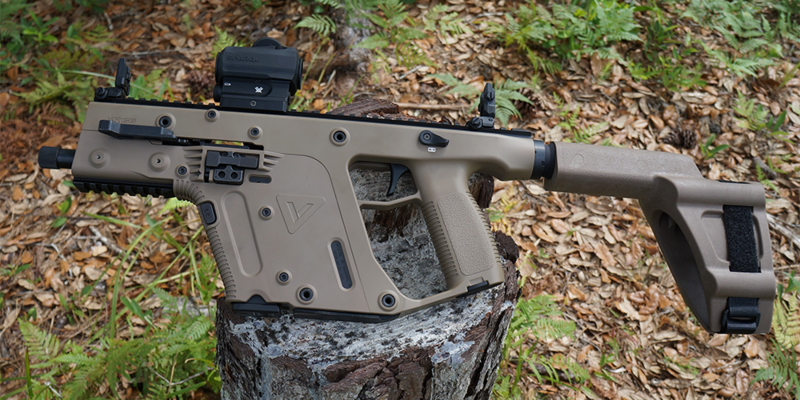 Overall, I feel the KRISS Vector is step in the right direction for a modern pistol caliber carbine. While there are aspects I would choose to change on the model sent for testing, I see great potential in it. As with most firearms designed to be used in a specific configuration, such as the HK MP5 / SP5K or the Uzi, there are things lost in the civilian translation. The KRISS is no different but fortunately this is a company built on being innovative, so I think what may not be readily reconfigured today, may be just a few short years away from being dialed in as the perfect option once properly licensed as a legal short barreled rifle (SBR).